That turkey or deer is just about in the right position for your shot, but suddenly you have the urge to cough. Try as you might, you can't hold it back and your attempt to muffle the sound doesn't work. Those envisioned photos of you with that gobbler or buck have now vanished just like the game you are hunting. Has this ever happened to you? I am sure most hunters have experienced this kind of problem. 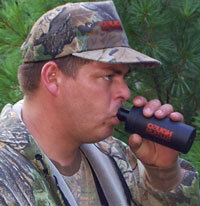 There is a new product that may help you on future hunts, it's the Cough Muffler. We saw this product demonstrated for the first time at the SHOT Show (Shooting, Hunting and Outdoor Trade Show) this past January in Las Vegas. When you cough into the Cough Muffler, the acoustic technology in the Cough Muffler silences your cough. You have still coughed but it can't be heard. For more information check out their website at www.coughmuffler.com.